A new interchange under construction to connect Al Mashaf Road and the new Al Wakrah Bypass. Qatar’s ambitious Expressway Programme, often described as the world’s largest road infrastructure project, is making significant progress with billions of dollars being spent to develop a modern and sustainable nationwide road network. The programme, spearheaded by Qatar’s Public Works Authority (Asghal), will create a network that will stretch over hundreds of kilometers, covering Doha City, the main cities, as well as outlying areas of Qatar and will see the construction of an array of underpasses, flyovers and multi-level interchanges to enable free-flowing traffic and improved journey times. One such key project under way is the Dukhan Highway Central, which upon completion, will create a vital link between Doha City and Qatar’s western areas. Ashghal has completed 82 per cent of the works on this project, which will provide a modern highway that will improve traffic flow between Dukhan and Doha Central, in addition to separating traffic movement on the highway from the internal roads. The Dukhan Highway Central project includes the construction of a new 15-km expressway stretching west of the existing Al Wajbah Intersection and ending 1 km east of Al Sheehaniyah town. The road comprises a dual carriageway with four lanes and service roads in each direction, as well as a cycle track to provide additional travel options and reduce the reliance on vehicles. 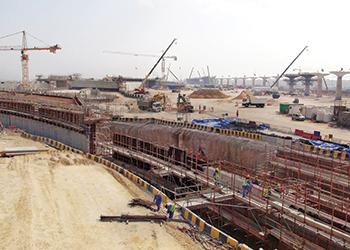 The project also includes the construction of two underpass interchanges, namely Al Wajbah Interchange and Al Dehailiyat Interchange, and a major multi-level interchange; and Al Jahhaniya Interchange, at the entrance of the Celebration Road, which will facilitate access to the commercial establishments in the area as well as Al Rayyan Stadium. Dukhan Highway Central ... 82 per cent of works completed. As part of the project, significant enhancements have been implemented on essential utility infrastructure including electricity stations, water, electrical and communication cabling, as well as a treated water effluent network and a surface water drainage network. The project also includes the construction of pumping stations between Al Wajbah, Al Jahhaniya, and Al Dehailiyat interchanges, vehicle weighing stations, and two camel underpasses to improve road safety. In addition, works have been implemented to renovate and upgrade two roads, namely Al Rifaa Road (Celebration Road), which is a 1.3-km dual carriageway with three lanes in each direction; and Military Road, a 2.2-km dual carriageway with two lanes and two roundabouts providing access to the new main gate of the Emiri Guard. Over the past two years, some of the major parts of the project have been opened to traffic. In May 2014, Ashghal announced the completion of construction works on Al Wajbah underpass while the following month saw the opening of a stretch from Al Wajbah Palace Interchange to Al Sheehaniya roundabout. The latter included 9 km of a four-lane carriageway towards Dukhan, the underpass of Al Dehailiyat Army Camp interchange, two underpasses for camels crossing near Al Wajbah Palace Interchange and Al Sheehaniya roundabout, as well as the opening of a service road on the northern side. In April 2015, Ashghal announced the opening of a 1.5-km section of the main Dukhan Highway extending from Dukhan towards Doha. This section has contributed to improving the traffic flow by providing four lanes in each direction, and separating the traffic to Doha from the traffic coming from beneath the steel bridge on the Temporary Truck Road, according to Ashghal. Ashghal is currently working on completing the works on Al Jahhaniya Interchange. To date, it has completed 76 per cent of the tunnelling work, 74 per cent of bridges, 38 per cent of roads, and 30 per cent of the interchange utilities. The authority has also started installation of utilities inside tunnels One and Two which were designed to serve as exits towards Doha, eliminating the need to pass from the Dukhan Highway. Work on the project was launched in April 2011 with CCC/Teyseer JV as the main contractor. The design and construction supervision consultant on the project is WS Atkins while the programme manager is Kellogg Brown & Root (KBR). 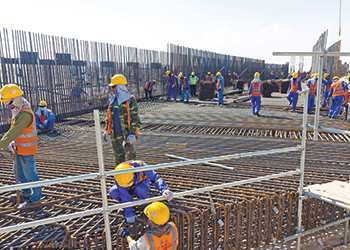 Base slab reinforcement is in progress on Al Wukair-Al Wakrah Bypass Interchange. 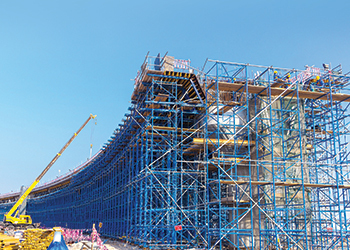 Among other projects that form part of the Expressway Programme, Asghal reports having made considerable headway on the construction of the Al Wakrah Bypass project notably on the bridges, roads and structures on the contract. Located to the west of Al Wakrah, the project calls for the construction of 11 km of new dual carriageway with five lanes (in each direction) running on either side of the central median. The project, which starts near Al Mashaf Road and extends to Mesaieed Road, includes five two-level grade-separated interchanges along with roads that will provide new access to key roads and residential areas such as Al Mashaf Road, Al Wukair Road, Road MAC, Mesaieed Road and Al Wukair area. Work on the project was launched in May 2014. Larsen & Toubro is the main contractor while KBR is the programme management consultant and CH2M Halcrow is the design building supervision consultant. The team is going ahead with the construction of mechanically stabilised earth walls (MSE) and to date, a total of 12,496 MSE panels have been cast and 9,054 sq m of MSE walls have been erected. This type of walls is characterised by its high capacity to carry heavy weight, says Ashghal. Additionally, a variety of techniques are being used on this project to waterproof the foundations and bridge decks to ensure the structural soundness of bridges and tunnels in the event of rainfall. Construction work has started on two bridges at the Al Wukair Road interchange, while substantial progress has also been made on the construction of the underpasses at this interchange as well as at Al Mashaf Road interchange. To minimise traffic congestion, trucks transport building and construction material only during the night. The project aims to create free-flowing traffic connecting Mesaieed and Al Wakrah City directly to the centre of Doha without the need to travel through Al Wakrah City. It will connect the south of the city to Hamad International Airport and New Hamad Port as well as the New Orbital Highway, connecting the south of the country to the north. The project will also become a key route to access the new Wakrah Stadium, a host venue for the 2022 Fifa World Cup in Qatar.